During the setup process, we choose the save to Google Drive option, since it is far easier for our teachers and students, but you can also save it locally on your device. The Drive option allows super easy access to all your recordings since a folder is automatically created. Screencastify has the ability to screencast in 3 different ways. You can simply capture your computer screen; you can simply capture yourself (or whatever the camera on the computer is facing); OR you can have a small picture-in-picture, where your computer screen is the bulk of the recording, but your camera is also capturing video. The free version allows videos up to 10 minutes long. Perfect for students and perfect for me! 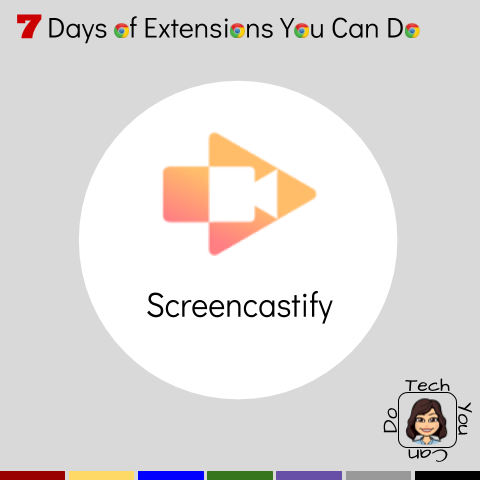 HOW I USE THIS EXTENSION ↬ I use Screencastify for numerous reasons. Quick "How-To's": I split my time between 2 elementary buildings & I often receive requests for help from teachers in one building while I'm at the other one. Sometimes making a quick screencasted video (where I capture my computer screen) is far easier to help than a long-winded email or text message. Professional Learning: I have also used the screen capture piece of Screencastify in order to share information regarding a district program to a large audience. This can be housed in a central location for future use. It works well for student's needs, too! I've made several videos that demonstrate how to log into various programs. To take my place: I am often invited into classrooms to co-teach and sometimes lead tech-infused lessons with students. I do my absolute best to not cancel, but unfortunately, I there have been a few times where I've had to cancel. I had the idea with one of the first times this happened to screencast myself sharing the lesson. I then shared the video with the teacher who could then show it. To flip lessons: you can easily video a lesson or activity so students (& their parents) have the ability to watch them as many times as needed. One teacher I work with has even created a YouTube channel focused solely on math for his young students. This has greatly helped parents hear and understand the math while they are at home! To share a creation: A junior high language arts teacher asked for my help. She had her students create picture books as a way to share their story they wrote around Christmas time. She explained that doing it "live" can be nerve-wracking. I asked if the goal was the actual presentation. She said no, it was a way to compliment the writing. I suggested having the student screencast their books (created with Google Slides). That way, they could practice and record as many times as needed to get to a video they would be happy to share. It also helps lessen the need to reschedule should a group member to absent. To help with fluency: I have helped 2 teachers teach their students to create screencasts to help them become better readers as well as more fluent. One teacher had her students share their videos with younger students. The other teacher simply has the students record themselves and then listen and watch themselves. What a cool and very low-key way for students to really SEE their reading ... and what awesome data the teacher gains over time with the student progress! I hope these few ideas I've shared inspire you to give Screencastify a try! 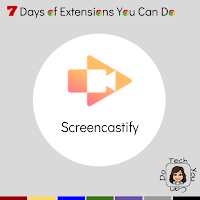 My goal this week is to share 1 Chrome extension each day ... if this extension has excited you, be sure to check out the others on my blog, "7 Days of Extensions You Can Do".